A new Human Rights Watch report says the Boko Haram insurgency in northeastern Nigeria has forced a million children out of school. The military is part of the problem, Mausi Segun from Human Rights Watch tells DW. 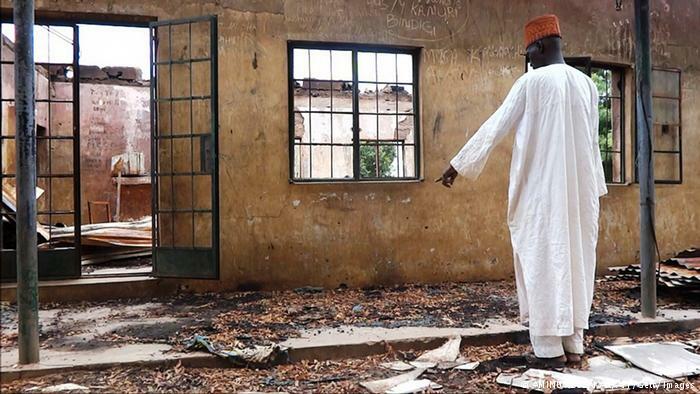 In a new report released on Tuesday, Human Rights Watch (HRW) said that that attacks carried out by the Nigerian Islamist group Boko Haram have had a devastating effect on education in the country’s northeastern region. The report highlighted the plights of nearly 1 million children, who have not been able to go to school as a result of the violence in the region. Mausi Segun, one of the researchers of HRW has been speaking to DW about their findings. Deutsche Welle: Can you briefly explain how bad the academic situation in northeastern Nigeria is? Mausi Segun: The system has been devastated by the conflict, especially in Borno State and to a smaller extent in Yobe and Adamawa States. In the entire region almost one million school-aged children are out of school and many have been out of school for at least the last two years, some up to three, four years. This means that almost an entire generation of children has been robbed of their right to education, which is an intrinsic component of their development. And so to our mind it is an emergency, a critical issue that the Nigerian authorities must pay immediate attention to in order to stem the tide of poverty and underachievement of children in this region that have lagged behind the rest of Nigeria for many years. In your report, you say that at least 611 teachers have been deliberately killed and a further 19,000 have been forced to flee since 2009. But what about those who have been left behind? How are they coping with the security situation? Many of them are living in displacement camps. Some who work for the government are earning small salaries even though they say it does not come in frequently. But they have many friends, families and neighbors that they have to take care of. A lot of them are deeply traumatized because they have witnessed the killings of their colleagues and family members. A few are doing some good by volunteering their time to teach children in the IDP camps, and some are setting up learning centers for children in host communities. But you can tell the frustration and fear that still exist. They are longing to return home to the life they knew, to the profession they love and enjoy, but unable to do so because of the fear that Boko Haram would kill them upon their returning. Boko Haram fighters as well as Nigerian security forces are turning schools into military bases, what can you tell us about that? While children were still in school, soldiers were placed in these schools ostensibly to protect the children and the schools. Unfortunately the very presence of armed forces at a school can make the school a legitimate military target. And this thing has happened in reverse as well. 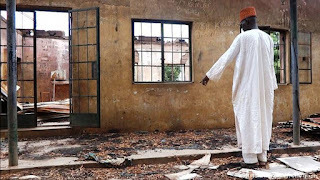 Because of the presence of Boko Haram fighters in schools, Nigerian security forces have targeted these schools. Many had to flee for their lives. For a station or a base, a school is not the best place because it might turn the school into a military target. What about those children that have been abducted by the extremists? You mention the Chibok girls and another 300 children that were abducted. How concerned are you that they are now being used as suicide bombers? It is a deplorable situation that would concern everyone. We are concerned at the level that we work. I can't imagine what it is like on a daily basis for the parents of the missing children, for their relatives and friends, their community members. I think for the Chibok girls, the activities of the advocates who have worked to continue to put pressure on the government have helped in some way. Our question is: What about the other children? I think the government needs to do a lot more to give names to these people by, for example, opening up a missing persons' register, where parents can put down the names of their children. They do not know whether they are dead or just missing, or whether they have been recruited to become suicide members or whatever. Even the dead have been buried without giving them names. The government must immediately set up a mechanism to ensure that they are given names and their dignity is restored.